Garlic has been around for a long time, and has only recently been re-discovered. Years ago it was placed in the tombs of Egyptian Kings. It has been mentioned in the Bible, and many ancient writings. Shakespeare and the Roman poet Horace both mentioned it in their writings. Today, garlic has become the world’s most popular spice. Today almost three pounds per person are consumed in the U.S.
Garlic has found its way into many facets of life besides just a spice. It is a great repellent for slugs and snails, and mosquitoes. It is also is reputed to bring good luck. If you are having Vampire problems, it is also great for warding them off. There are actually about 500 members of the Garlic family. (Allium) The most common is domesticated garlic. (Allium Sativum). Garlic grows underground like an onion. Its bulbs are covered by a papery skin. Inside each bulb are the individual cloves. It is very important in cooking that this little fact is recalled so as not to get too much, or too little, in your recipe.Garlic, (and chili peppers) have always been high on the list of “Folklore” medicines, but only recently have many of their purported health benefits been medically substantiated. 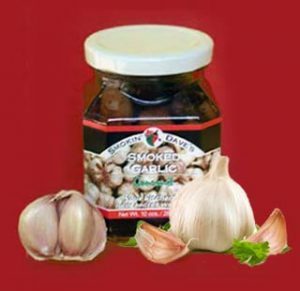 Following is a list of benefits derived from garlic consumption. These benefits are now recognized as medical facts vs. folklore. 1. Numerous cardiovascular benefits, including lowering of: Blood pressure, platelet aggregation, serum triglycerides, and LDL cholesterol. Prevention of atherosclerosis, and diabetic heart disease, and reduction of heart attacks and strokes. 6. Protect against diabetes related degenerative diseases. 9. Cure for impotence due to poor circulation. 11. High in vitamin B6, Vitamin C, manganese, and selenium.